Request Management | AGL | Applied GeoLogics Inc.
Requests are when citizens or a member of an organization asks for information or work to be performed. Requests can be associated with more than one Task, but Tasks can only be associated with one Request. Request entry is performed using the Create Request guided process. Requests can be submitted from a specified person or anonymously. Selecting an issue is required because it helps refine what is available in the guided process. When you select an issue the default department, priority, and Request with the same issue display. An issue can be marked as No Location in the Issues Library. When a No Location Issue is selected no map displays. For example, Billing Question or General Information. Anonymous must remain in the Requester library. While creating a request all open and recently closed requests up to seven calendar days display on the map. Cartegraph, a leader in high-performance government software and services, has announced an exclusive partnership with citizen request leader, SeeClickFix. This connection is bridging the gap between residents and their local government by providing a mobile, citizen-first approach to operational communication and productivity. Through this partnership, the power lies in the hands of citizens. 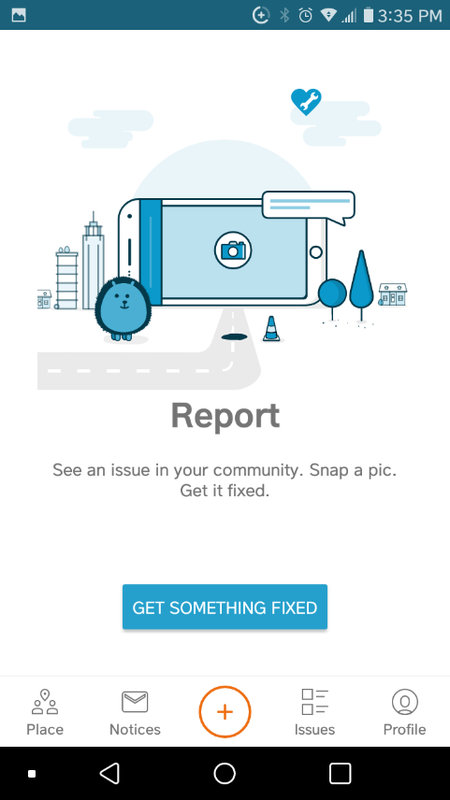 Using their smartphone or computer, a resident can use SeeClickFix to find information on community services and events or instantly notify city staff of non-emergency issues—such as potholes or graffiti. When those requests come in, they are passed instantly into Cartegraph OMS, the operations management system trusted by public works teams, water departments, and parks across the country. Relying on mobile technology, these teams can see and respond to requests in record time—notifying the citizen every step of the way. Quick and easy report of routine service requests, and non-emergency issues. Displays issues both new and previously submitted with the current status. Different sign in screen than Cartegraph which provides access to any authorized employee even if not a Cartegraph user. Employees are given access at the role level, though an anonymous sign in proves an available option in System Settings. Roles may receive access to both Cartegraph and the Internal Request feature, or each one separately. Each Request Issue type has the capability of customizing submission fields to collect exact information regarding the reported problem. My Submitted Requests list features a display of columns as well as the option to hide the display. Lists always remain hidden for anonymous users. Including photos with requests comes as a default option, but allowing image attachments may be turned off. NOTE: Only image files can be attached to internal requests. Users entering a request are automatically added to Requesters library, followed with a Requester record featuring the first and last name as well as the Email address from their User ID. When applying changes to the User ID, it creates a new entry in the Requesters library upon the next entry into the Internal Requests feature and remains associated with that Requester record for future requests. New Requests match to existing Requester records of the User automatically. First names, last names, and Email addresses tie requesters to their User IDs. Alterations must take place in the User IDs, not the Requesters library. Changes in the User ID are shown and tracked under a new Requester. All requests submitted with a User ID display for the user after signing in to the Internal Requests feature which allows for the observation of both present and previous issues as well as their current status. Library Manager allows tracking of users within the Requesters library. A System Setting is required to allow anonymous sign in. Users can sign in anonymously at the Sign in screen by clicking the Sign in Anonymously check box, to only submit requests under the ID Anonymous. The Internal Requests feature displays a value of Internal Request in the Entered By field for anonymous users. Requests entered through the Create Request feature in Cartegraph display a value of the user signed in to the request in Cartegraph. The request summary page includes a map, location information, an issue description alongside its priority and a standard operating procedure, requestor information and requestor logs, internal comments, a task summary (e.g. projected, planned, in progress, completed, and cancelled), attached files, and more. Cartegraph is Open311 compliant. This allows citizens to use Cartegraph‘s SeeClickFix or other third-party applications to electronically report non-emergency service requests from their smartphones or tablets. Open311 is a standard that provides an open, consistent, and streamlined process for request management and integration. For more information visit open311.org. After requests are submitted using SeeClickFix or a third-party application, requests are vetted and managed in Cartegraph. NOTE: The Request Issue’s Code field is required for Open311 compatibility. Open311 requires a code to create the request. Clients work with Cartegraph Client Services to setup Open311 specific functionality.